Jim Haley picked up his first multi-hit game of the season Monday. PORT CHARLOTTE, Fla. (April 8, 2019) - The Bradenton Marauders used a five-run rally in the top of the fourth to take down the Charlotte Stone Crabs 6-1 Monday night at Charlotte Sports Park. With the game tied 1-1 in the top of the fourth, Marauders (4-1) catcher Raul Hernandez and Adrian Valerio both singled to left on the first pitch of the at bat. After a passed ball, Daniel Amaral singled to center to score both runners to make it 3-1 Bradenton. Two batters later, Cal Mitchell ripped an RBI triple to the right field corner to make it 4-1. That knocked out Charlotte starter Paul Campbell (0-1), who surrendered five runs on eight hits in 3.1 innings. With Brian Shaffer pitching in relief, Gregory Polanco pulled a single into right to score Mitchell and make it 5-1. Three batters later, Lucas Tancas pulled a base hit to left to cap the rally at 6-1. Bradenton got the scoring going when Travis Swaggerty led off the first with a single to right. After he stole second, Oneil Cruz delivered a two-out single to center to give Bradenton a 1-0 lead. 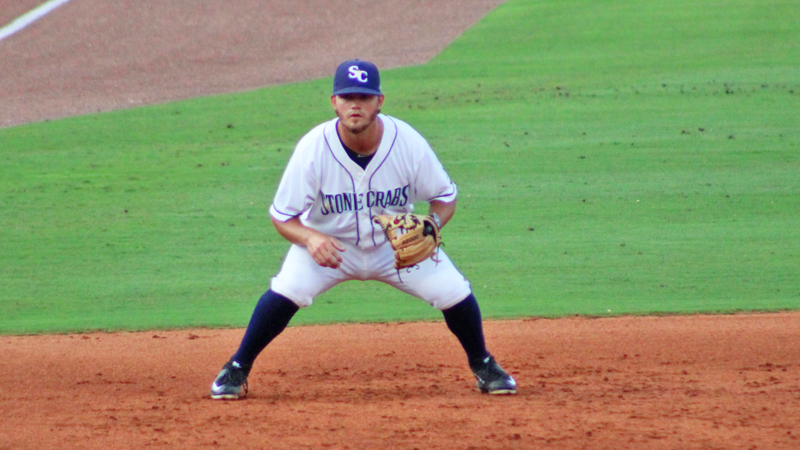 With the Stone Crabs down a run in the bottom of the first, Vidal Brujan singled to center to start the inning. After he stole second and third, Ronaldo Hernandez dropped a single into right to tie the game at one. The Charlotte hitters had a tough time figuring out Bradenton starter Cody Bolton (1-0). The 20-year-old right-hander allowed only two hits over five innings of one-run ball, locating his 96-mph fastball effectively. Despite the slow night offensively, the Stone Crabs' bullpen turned in five scoreless innings from the fifth inning on. Charlotte right-hander Jack Labosky struck out five over two scoreless innings in his High-A debut. The Stone Crabs will look to even the series Tuesday at 6:30 p.m. Riley O'Brien (0-0, 5.79) makes the start for Charlotte against Domingo Robles (1-0, 0.00) of Bradenton. Coverage begins at 6:15 p.m. on the Stone Crabs Baseball Network.